The Museum was built on the western part of Mavromati village, on land granted to the Archaeological Society. The Museum has a significant collection of sculptures. Among them the Doryforos of Polykleitos, Artemis Laphria, Hermes of the Andros-Farnese type, as well as fragments of sculptures by the Messenian Damophon. The Artemis Lafria was discovered earlier, in 1986. It represents the goddess with her right hand raised, ready to draw an arrow from her quiver. In the Museum’s catalogue more than 12,000 findings have been recorded, a huge number, considering the restricted exhibitional space. It is impossible, of course, to exhibit them all simultaneously, so most of them remain in storage, waiting for a bigger space to house them. 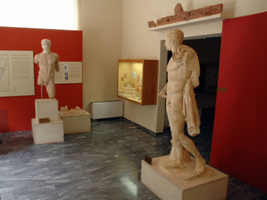 Nevertheless, the Archaeological Museum of Messene remains one of the most noteworthy in the area, and a visit there sheds light on important aspects of the area’s historical past. 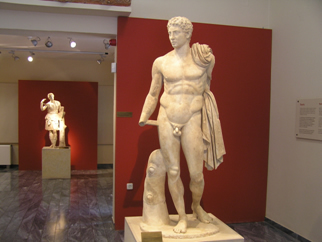 The Messenian sculptor Damophon is adequately represented in the museum, where several fragments of his works are on display. Damophon was the most important sculptor of the Late Hellenistic period, and thanks to Pausanias we can be certain of at least 15 of his works. He specialized in sculptures representing gods and heroes, which is why his creations were usually of colossal dimensions. Apart from his homeland, Messene, his works have also been found on Aegean islands, in Megalopolis and Lykosoura. As regards the history of the excavations, they started in 1895 by Themistocles Sofoulis and were continued in 1905 and 1926 by Georgios Oikonomou. Anastasios Orlandos then took over (1957-1975) and after him Petros Themelis, who started in 1986 and continues up to the present day.